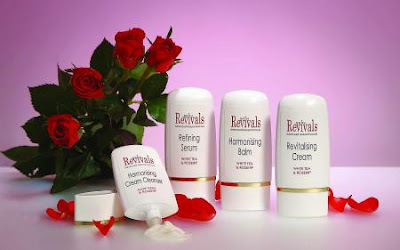 Review: Skin Revivals Starter Set - MUST HAVE PRODUCT ALERT!!!!!! I'm sorry to be so dramatic with the heading of this article, but I HAVE to emphasise just how much I LOVE this skincare set from Beauty Naturals! One of the many perks of beauty blogging is that we sometimes receive products to test and review, and usually these products are nice - but I have yet to fall so head over heels in love with both a product AND a brand as I did when I received this Skin Revivals set! 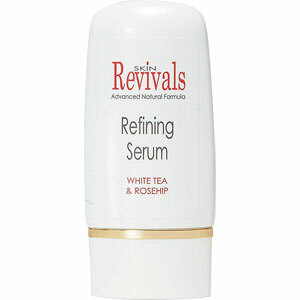 As a company, Beauty Naturals began selling natural beauty product by mail order in 1980 and launched online in 1997. They are now one of the leading natural beauty product companies within the UK. The Beauty Naturals website stocks many well known brands such as Burts Bees and Orly, and also features five of their own brands - Martha Hill, Purely Hair Care, Herbals For Health, David Hill and Skin Revivals. "Four advanced formula products with a unique combination of White Tip Tea Extract, Rosehip Oil and active organically certified botanicals selected for their specific anti-ageing benefits." My first impression of the packaging, I must admit, was that its very plain. I am usually someone who is sucked in by pretty packaging, but once I realised the quality of the product inside this was no longer an issue for me! Now I have to admit, I am not the best at keeping up with skincare routines! My "routine" generally consists of occasionally removing my make up with a face wipe before bed and sometimes using beauty balm before bed - I know, I know - bad beauty blogger!!!!!!!!! I have been using this before bed each evening - the description on the bottle advises you to apply to face and neck, and remove using a warm, wet muslin cloth. 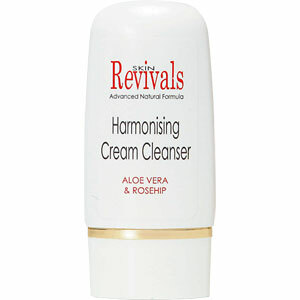 It promises to polish the skin, lift dead skin cells and remove every trace of make up. The first thing I was impressed with was that the muslin cloth was included with the set - I hate it when you buy a product only to get it home and realise you need something else to be able to use it! - applying the cream is really easy as its a lovely consistency, and it isn't overly scented. It is also very easy to remove and I find the whole experience quite relaxing - I was amazed at just how clean my skin feels afterwards! The products are gentle enough for use around the eyes, and I was really impressed that it managed to remove every little bit of rubbed-in mascara from my eye area. After using the cream cleanser, I then use the refining serum which is a deep penetrating moisturiser promising to help give the skin a lift and minimise the appearance of fine lines while restoring skin tone and texture. The description warns that the "tightening effect is immediate" but I took this with a pinch of salt, as I have read things like that before and never noticed the effect - but I was wrong! As soon as it is applied, you can really feel the tightening sensation! The product is again only very lightly scented, but a word of warning - its quite runny so you do have to be careful not to spill any! 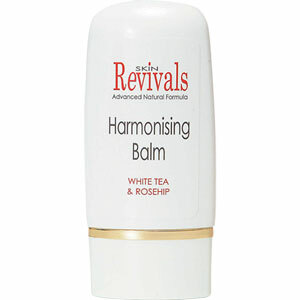 After the tightening effect of the serum, you do feel like you need another product quickly and the harmonising balm is ideal! 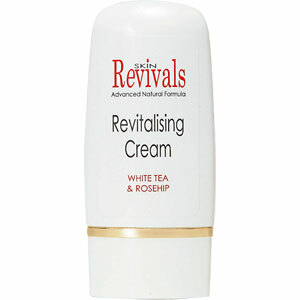 This is a light moisturiser that aims to smooth, soften and protect the skin. Again, it has a lovely consistency and glides on easily - it absorbs into the skin very quickly and doesn't leave behind a greasy residue so it is an ideal make up base!! After using these three products my skin feels amazing and looks so healthy! I use this cream at night, after cleansing, and find it to be a perfect light night time moisturiser. My skin feels refreshed almost immediately after a quick application of this cream and again, it absorbs very quickly. After two weeks of using this set, my skin feels and looks so much healthier than before! I have been converted and will certainly be keeping up with my new skincare routine. The set is an ideal size and comes in a handy little pouch, so would be perfect for travelling and I plan to take it with me in my hospital bag when going in for my c-section. I really can't recommend the set highly enough. The Beauty Naturals website is definitely worth a look as they sell a wide variety of really lovely products, and - best of all - standard delivery is always free!! I personally can't wait to try more from them, as I seriously have not been this impressed with a product for a long time! The Skin Revivals Starter Set is available from www.beautynaturals.com for £18.80, and the products inside are also available to be purchased separately. Have you tried this set or any of the Beauty Naturals ranges before? I'd love to hear what you think! Damn you.... I have wanted to try this for yonks!! Lol! I really think you'd love it! It is honestly a new Holy Grail item for me! That's a great price for a set! I'm currently obsessed with finding and trying get that perfect match of skin care for my skin after I had an allergic reaction, this review is so good - literally so in depth and I REALLY want to try this stuff it looks un real! These look gorgeous!! I love Rose scented stuff too! I will be looking at these online as soon as I've finished having a nose!! I'm a new follower of yours! :D Can't wait to read more! Thanks for following! They really are fab! Thanks so much for sharing these products! I am wondering about the products that were proscribed by your AZ dermatologist.